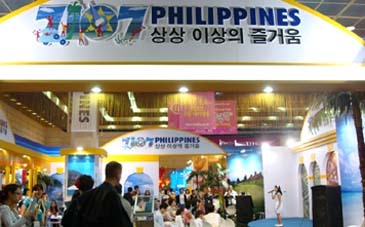 The Philippines booth attracts numerous people at KOTFA in Seoul. The 21st Korea World Travel Fair (KOTFA) was the largest event in 20 years of long successful history of KOTFA since its foundation in 1986. There were 416 organizations from over 50 countries worldwide providing 481 booths including tourism association, hotel, airline and many other travel agents. With its worldwide recognition, KOTFA attracted over 10,000 industry professionals and 65,000 consumers with various exhibition halls such as Domestic Tourism Hall, International Exhibition Hall, Tourism& Leisure Product Hall, and Event Hall. Maricon Basco-Ebron, tourism director and attaché at the Embassy of the Philippines in Seoul, said that she wanted to see about 20 percent Korean-tourist increase to the Philippines in 2008 through this KOTFA event. "The very purpose of participating in KOTFA is because it is the biggest travel fair in Korea and because Korea is our No. 1 market. I see the body of participation every year," said Maricon Basco-Ebron. "I hope we can attract a lot of student market as well as golfers, divers and retirees with our natural environment in the Philippines." 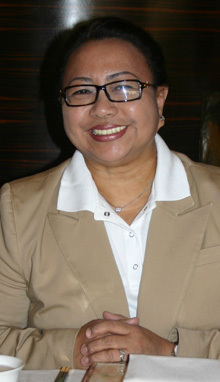 Ms. Maricon Basco-Ebron in Seoul — Ms. Maricon Basco-Ebron, tourism director of the Philippine's Department of Tourism (DOT). She is also a tourism attaché at the Embassy of the Philippines in Seoul. As tourism point woman she is one of the most active tourism directors of foreign countries operating in Seoul. The Philippines booth had quiz show to give audiences more knowledge on the Philippines and caught attraction with Filipino kids singing group singing Arirang and other musical songs. Tourism Malaysia presented golf putting and dart games, and also the famous Malaysian bakery brand Rotiboy bun tasting event with Sophia Ridza, one of the telecasters in Korean global talk show "Beauties' Chattering." Korean Pop singer Younha who is well-known musician in both Korea and Japan performed a special stage called "Talk & Live Yokoso Japan!" as a goodwill ambassador of Visit Japan Campaign (VJC). Folklore performances including traditional dance and singing held at Event Hall gave Korean audiences more insights to various cultures of Philippines, Malaysia, Japan, Indonesia, Brunei to many other countries. Audiences were not able to take their eyes off the stage as 12 countries performed their own dynamic and cultural performances. Experience Hall presented porcelain ware display and manufacturing experience, folklore crafting and photo exhibition, while International Folklore Product Hall displayed folklore product and sale. KOTFA also offered muti-vision display and door prize events that caught many people's attention and gave chance for them to get to know about unique cultures of many different countries. Malaysia booth is one of the most popular at KOTFA in Seoul. Not only International booths offered enjoyable moments to many participators but also Domestic booths gave fascinating events for tourist attractions. Gangwon Province gained popularity mostly from students and foreigners for its paper handicrafts, digital dyeing, and Chosun folk painting events under the catch phrase of "Fun Fun Fun Gangwon Province!" and publicity concept of "Go Go Gangwon Province!" Jeju Province focused on informing its dynamic image of leisure and sports and drew attention with its principal products try out corner including tangerine juice and tangerine chocolate. Daejeon City was praised for its active marketing on hot-spring resorts, high-technology and Expo Park located in Doryong-dong, Daejeon. A large crowd gathered to participate in scientific experiment event provided in Daejeon booth. The 21st KOTFA, hosted by Korea Tourism Association and sponsored by World Tourism Organization, Ministry of Culture, Sports and Tourism and Korea Tourism organization, was held at Atlantic Hall, COEX in downtown Seoul on June 5 through June 8, 2008. Grace Kim serves as staff reporter of The Seoul Times. Born in Connecticut in the US, she grew up both in S. Korea and in the US. She studied political science and sociology at the University of Wisconsin at Madison. Perfect bilingual Grace covers political and foreign communities. Her hobbies include jogging and swimming.